Much has been written on the plight of the unemployed in terms of lost income, diminished self-esteem and depression and stress on families. Just last week, Rutgers University’s John J. Heldrich Center for Workforce Development published its latest findings on the consequences of long-term unemployment, which provides a dreary picture of a highly troubled and disaffected slice of U.S. society “devastated” by the Great Recession. Less is known about the effects of unemployment on family stability and its short-term and long-term consequences for children. While there are numerous socio-economic theories on what contributes to the breakdown or disintegration of the family unit, unemployment ranks as one of the leading causes of family instability. A recent study by researchers at the Urban Institute tells the story: families become far more unstable – and prone to dissolution -- when one parent loses a job. The research by Stephan Lindner and Elizabeth Peters tracks the effects in the first year of a job loss for families with children under the age of ten. The study distinguishes between five different family arrangements from the perspective of a child: married parents; unmarried biological parents who live together; mothers living with a partner who is not the biological parent of the child; single mothers and single fathers. “Our results suggest that children who experience an unemployment event in their families are also more likely to see a destabilizing change in family arrangements in subsequent months, irrespectively of the initial family arrangement,” the study stated. 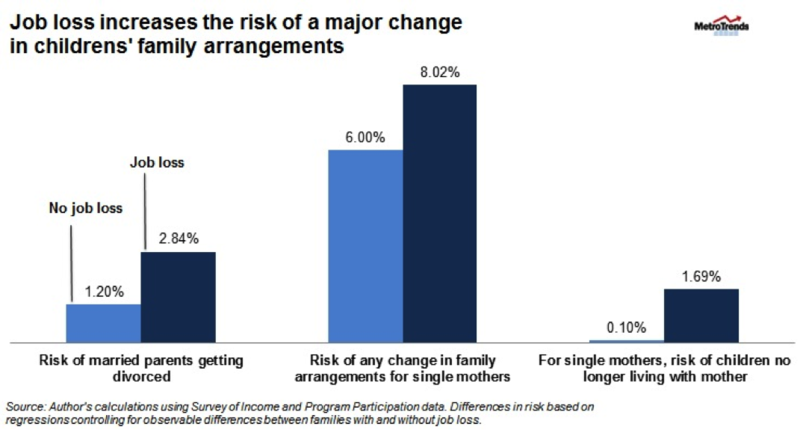 The most striking finding in families with married parents was the risk of divorce more than doubles when a parent loses his or her job, Lindner wrote in his blog. Unemployment is also extremely bad for children of single mothers who have little education, the researchers found. “These children are at a higher risk of not living with their mother during the year following her job loss compared with children with single mothers who are employed,” Lindner explained. This is particularly true for single mothers who have no high school degree. The chart below from MetroTrends illustrates the adverse impact of job loss on family stability. The researchers say that new living arrangements precipitated by the loss of a job can be detrimental to a child’s development. It’s no surprise that the loss of a job can be devastating to marriages and households in the aftermath of a prolonged recession that has changed many Americans’ views of marriage -- for the worse. A child who has lived through their parents’ divorce has long-lasting scars. If the scars are because of financial insecurity, they can influence that child’s life decisions for years to come. That could be one reason why many younger Americans are delaying marriage until they’re financially stable. According to a new study released last week by the Pew Research Center, the share of American adults who have never married is at “an historic high,” after years of a declining marriage rate. In 2012, one in five adults ages 25 and older had never been married, according to the Pew analysis of census date. By contrast, only about one in ten people in that age bracket had never been married. “Adults are marrying later in life, and the shares of adults cohabiting and raising children outside of marriage have increased significantly,” the report stated. Such relationships appear highly vulnerable to the effects of joblessness – including the breakup of families unable to deal with the stress.